Ever had that awkward moment when you’re about to pay for coffee and you find out you’ve left your card at home and don’t have enough change? Well, a new card-less payment service will let you pay by scanning your hand so you never have to worry about holding up the line. The PulseWallet syncs your credit card to the palm of your hand through the device’s internal biometric technology. Using built-in Fujitsu palm-scanning technology called Palm Secure, the electronic device photographs a person’s unique vein pattern just below the skin. The distinct pattern of each individual’s veins makes forging extremely difficult. “You are your wallet. Secured with a key that only you hold,” the website says. Once you’re synced up with your chosen payment method, you can easily swipe your hand over the scanner at any participating PulseWallet business (none so far). The system, which was officially unveiled this week at the Consumer Electronics Show in Las Vegas, will go on sale in February for an undisclosed amount, the Verge reports. In 2012, a similar biometric palm-scanning technology was deployed in Pinellas County schools in Florida. 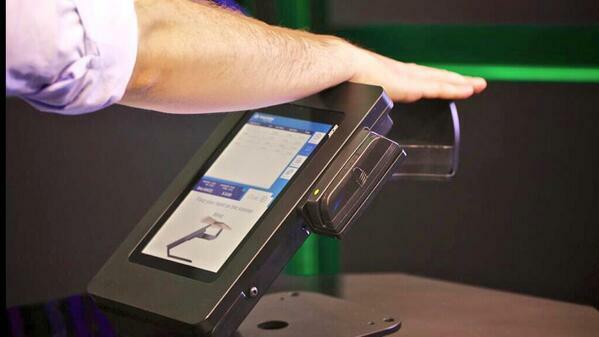 Students who forgot to bring money for lunch to school could pay for their meals with a wave of their hands over the palm scanner, which was synced to their parents’ credit cards, USA Today reported.